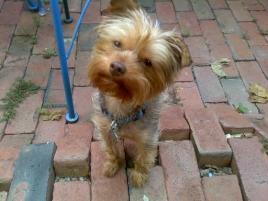 Ms. Lulu was a Chocolate Yorkie backyard breeder female. She went into labor distress and her owner refused to pay for a Caesarean. Shih Tzu and Furbaby Rescue was called but alas the puppies were stillborn. When I adopted Lulu (aka Truffles) she was a wreck, but I could see intelligence in her eyes. She was unsocialized, deathly afraid of humans, and very sad. I didn't know she had a tail for two months because she kept it tucked under her. She wouldn't walk on a leash, she was so frightened of everything around her. Within a few months and with the the help of my trusty Australian Silky , Lucky Oliver, LuLu began to blossom! She now LOVES to go for leash walks, and races around to greet me when I come home. Here she is after her first salon visit. She is safe now and will live a happy life with me & Lucky O.